Educators often develop digital learning programs to meet youth interest. But they can also leverage these interests by directly involving them in design of new programs, leading to deeper learning and engagement. This resource explores what this looks like in practice. Youth come into informal learning environments with their own interests and expectations. These interests can present powerful pathways towards deeper learning, and present both participants and educators with a starting point for thinking about new programs. However, it’s not always clear how this might work in practice. 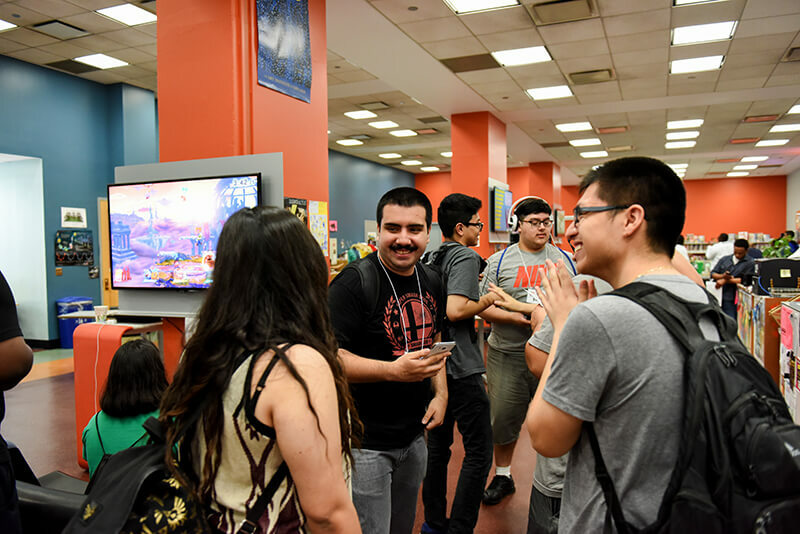 Here, we share how Chicago Public Library’s YOUmedia program uses an approach to youth development that supports teen participants to be actively involved in the design of their own programs with the guidance of librarians. 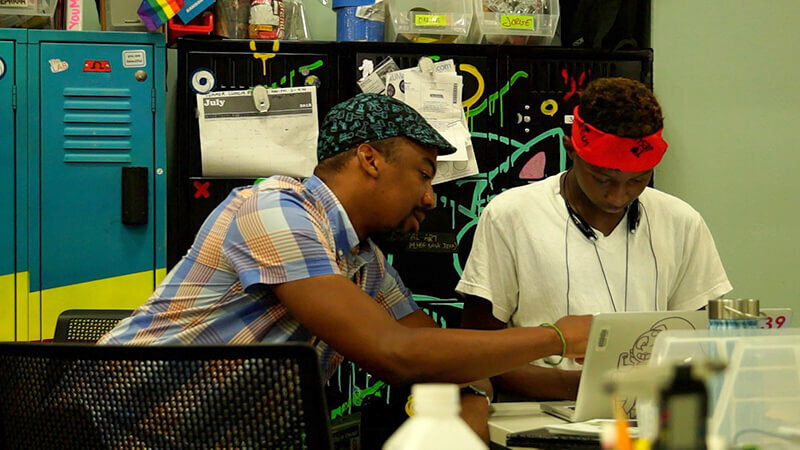 Inspired by cooperative design methods, YOUmedia taps into youth interest to create meaningful, engaging, and well-loved programs alongside their teen patrons. In this brief we first explore the idea of cooperative design, outlining various approaches that can support organizations to think through what might work best in their context. We then explore a number of programs developed through YOUmedia’s cooperative approach — professional level gaming tournaments, a literature fest aimed at teen reading interests, and a video blog called Let’s Play are all programs co-developed by teens and adults. We highlight the way YOUmedia facilitates the creation of these programs through a ‘mini grant’ program, which supports individual librarians to recognize and cultivate youth interest at a local, branch level. We then describe what kinds of outcomes are associated with this approach, highlight tensions and challenges, and share tips and guiding questions you can consider in your organization. While [youth] cannot do everything that an adult can do, as partners [youth] can have an equal opportunity to contribute in any way that is appropriate for the design process. For example, adult researchers that are visual artists or educators can support the technology design process with domain specific expertise and experience. Each cannot do what the other does well. The same can be said of child researchers. They too have special experiences and viewpoints that can support the technology design process that other partners may not be capable of contributing… (Druin, 2002). Druin offers a framework for understanding different roles and positions that youth might play within the process of developing a new learning experience. At a surface level, programs are designed by adults and then experienced by youth, with the youth as ‘users’. Going further, educators might involve youth as ‘testers’ for new designs or programs, with youth experiencing prototypes and giving feedback on them. Teens might also be used as ‘informants’ – for example a focus group during a critical stage of the program. And finally, we can think of teens as design partners, where they are involved in the design process every step of the way, from ideation of new programs to design, implementation, reflection, and iteration. to develop new programming both for and with youth? participate in pilots for new approaches or tools? [Co-design of programming] happened a lot with my gaming group. It started when I noticed there were a lot of teens playing video games in the space and I wanted to engage them somehow. I was like, oh we’re going to do a video game blog. It’s going to be great. We’re going to write. But they didn’t want to write after school. So then I thought, okay they want to talk about games with me, but how do we turn this into something production oriented, which is how the podcast happened, which we did for five or six years. At a certain point, one of my teens came to me and said, “Oh, there’s this new smash brothers game coming out and have you done a ‘let’s play’ before? Do you know what ‘let’s plays’ are?” I said, “I kind of vaguely know what they are. The YouTube videos of people playing video games with commentary over top.” He responded, “Well, can we do one of those? Can we do like a series? One to represent each character that’s going to be featured in the new Smash Brothers game.” I said, “Okay, why not?” We can figure it out. We have the tools. Let’s do it. And then that gaming group really shifted to a focus on let’s play production, because that was the way that they were engaging in video game culture at that point. It stopped being about podcasts being the way for them to discuss games. Let’s plays [were] what was relevant to them and what they wanted to make, so there was a total shift there and then in the past year, there was a shift from YouTube lets play videos to streaming on Twitch. They’re like, “no we want to stream now, not make let’s plays,” so a lot of that is driven by, I think, the media that they’re consuming and they decide this is what I want to make, because it is sort of the dominant force. We can imagine a different possible outcome: Taylor makes a gaming program with no youth involvement, which is perhaps somewhat popular, but falls off quickly. 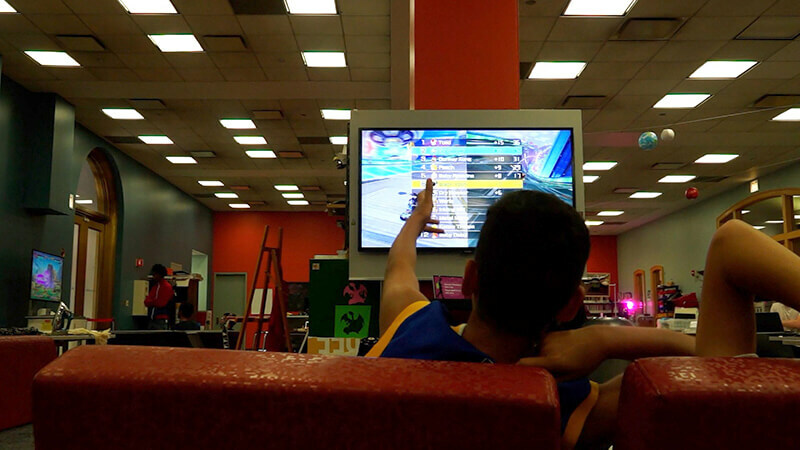 Or the youth leave the library to play games by themselves with guidance towards taking on more leadership roles. 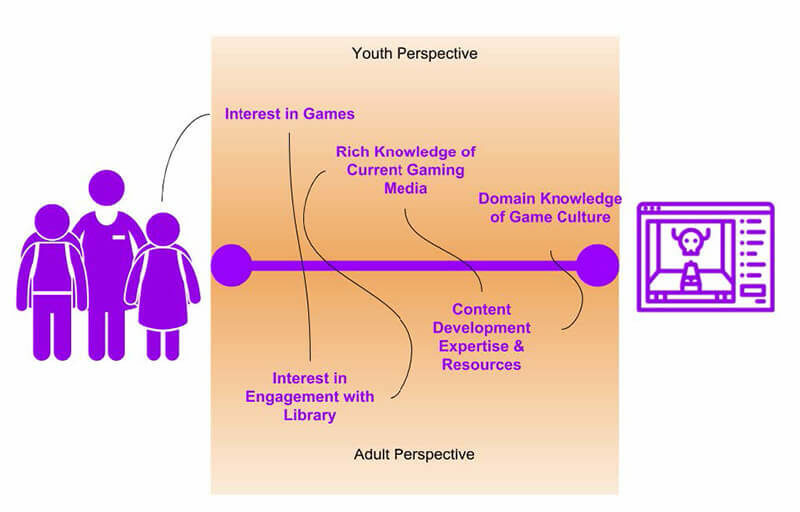 Instead, as visualized in the diagram above, there is a give and take: youth bring their passion and interest to the library, Taylor uses her expertise as a librarian and her own interest in gaming to recognize the potential for engagement, Youth provide knowledge of their interests (and have the freedom to do so) to structure a meaningful and appealing program, Taylor uses her expertise with media creation to help them put that into a polished format, and the youth further refine the format by gearing the program towards a more relevant and current genre of practice within the gaming world — live streaming. Apart from the benefits to both the program (relevant and attractive activities for youth), and to individual youth (hands-on knowledge with media production), there is also a question of equity. Cooperative design brings more perspectives into youth development, allowing for youth to create meaningful programming that is culturally relevant and tied directly to the lived reality of their lives. Devon graduated this past year. He wasn’t really involved in YOUmedia his freshman and sophomore year. He would come to the space and play video games… Teens would play Super Smash Brothers in the space and then they got kind of rowdy and things got a little bad… So we made the decision of removing the game from our collection, but telling the teens if they wanted to play it, they had to organize a tournament in order to play the game. That sparked something in Devon and he decided he was going to create tournaments, and not just like a little tiny tournament, these were going to be big scale professionally run tournaments, because he had been to some professional tournaments and found them really uninviting for a newbie and for a teenager, so he wanted to create something that felt professional, but was welcoming. So I worked with Devon over the course of two years and we went from his first tournament, which was 20 people, to tournaments that got up to 100 participants. We first had them in YOUmedia and then we moved to another library space. To do that, we had a meeting with one of our staff members from corporate and private events get involved, so [Devon] had to learn about space planning, planning for fire code and following all of the regulations of the building. 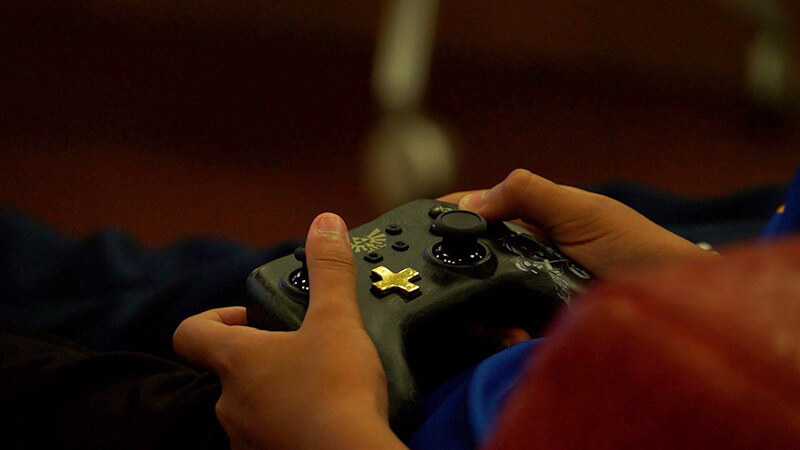 Devon’s gaming tournaments started with an interest that he had – playing Super Smash Brothers with his friends. However, this interest was mediated by the expectations of the YOUmedia space, leading to the structure of tournaments. Building off of that interest and expectation, Devon worked with the expertise of librarians as event planners and organizers to create something ambitious — gaming tournaments at a nearly professional level, similar to the recent rise of eSports tournaments across the globe, an increasingly big business. Apart from creating a successful program, Devon also learned about event planning, community organizing, and collaboration. More than him just being a source of information to structure a program, by involving Devon, he grew as a person, a professional, and gained valuable skills and knowledge in his work with YOUmedia. The example above points towards a vital aspect of programming driven by youth interest. 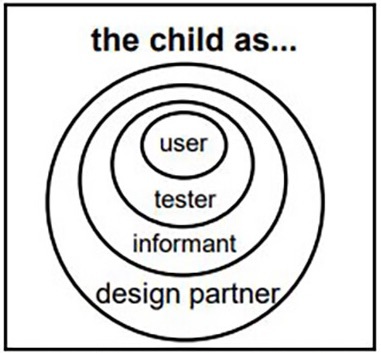 In the example, Devon is likely somewhere in between an informant and a design partner. Sometimes your youth participants might be better situated as a user (for example, suggesting an outside speaker to come to talk about local history), and sometimes they might be best used as an informant (helping to give feedback on policies around material usage), but here we are encouraging you to think how you might engage your youth fully as design partners, as Taylor did with Devon. Devon’s professional-level tournaments are just one example of how YOUmedia succeeds in structuring opportunities for youth co-design. The excerpt above exemplifies the YOUmedia approach, where motivated youth tap into informal interests and gain valuable experience in planning, organizing, and designing programs through the support of educators. But how can this kind of approach be supported systematically? At the Chicago Public library, the YOUmedia program, supported by a central team that serves almost twenty YOUmedia branches, and program coordinators provide resources to nurture youth interest through mini-grants – small dollar awards given to local branch young adult librarians that can be used to support the development of ideas from teens. Aimee Norris and Deanie Adams, Sulzer’s two teen services librarians, say that the students they work with were the ones to initiate the program. “A lot of these kids were born in the 2000s and grew up with computers all around them,” Norris observes. As a result, she and Adams have both seen the students take a great deal of interest in comics and zines’ handmade, tangible, and distributable qualities. Norris says that is why an event like Comic Fest was such a natural fit. Borrowing concepts from established events like Zine Fest and the Chicago Alternative Comics Expo (CAKE), the teens reached out to comics artists and zine producers from around the city. Skills like design thinking, collaboration between adults and youth, fresh perspectives for adults, and expert skills in practical elements (e.g. Devon as an event planner, or Taylor’s group as media producers) for youth, working in multi-generational teams. Culturally relevant programming in local communities, designed by members of that community. Youth buy-in in programs, with youth acting to promote and attract friends to programs that they have designed, and are eager to see succeed. Contribution to community, with youth working to produce opportunities for their peers that are meaningful. Increased youth motivation and agency through the development and implementation of something rooted in their interest. Participatory Design For Learning – A volume detailing current thinking on using participatory design as a method to develop powerful learning experiences. Gains from Participatory Design Team Membership as Perceived by Child Alumni and their Parents – An article from the University of Maryland Kids’ Team details the multitude of benefits that youth participants gained from working as part of a participatory design team with adults. The Role of Children in the Design of New Technology by Allison Druin, outlining various roles that youth can play. Division of labor and decision-making. A key question, and potential challenge, of involving youth in the design of new programs concerns what their responsibility is, versus what role educators will play in the process. Being intentional and clear about who is doing what and who has decision-making power can support reaching the outcomes you care about. See our resource on adult/youth collaboration for more perspectives on this issue. Design is a skill, and not an easy one to master. Both adults and youth must be open to learning and trying new approaches in order to arrive at new program designs. Working as a team requires trust. Adults must trust that youth are committed to a large, difficult project. Youth must trust that adults actually value their input, and will follow their lead. Co-design is labor intensive. In many ways, adult educators taking the reins for a passive youth audience is easier, since they’re already accustomed to that way of working. However, in doing the work of cooperative design, both adults and youth benefit.